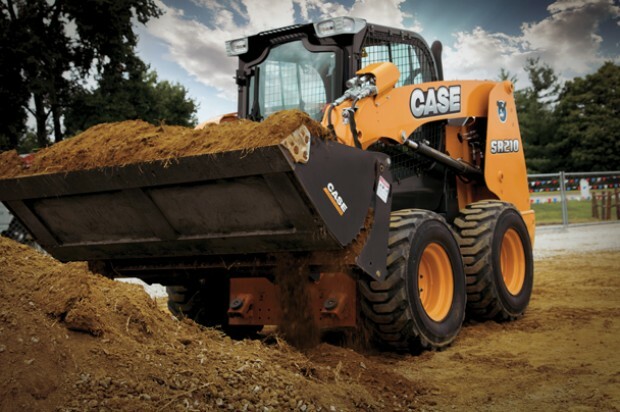 Case Construction Equipment has manufactured skid steers since 1969, starting in Burlington, Iowa, and eventually moving the production to Wichita, Kan., where each Case skid steer is still produced today. 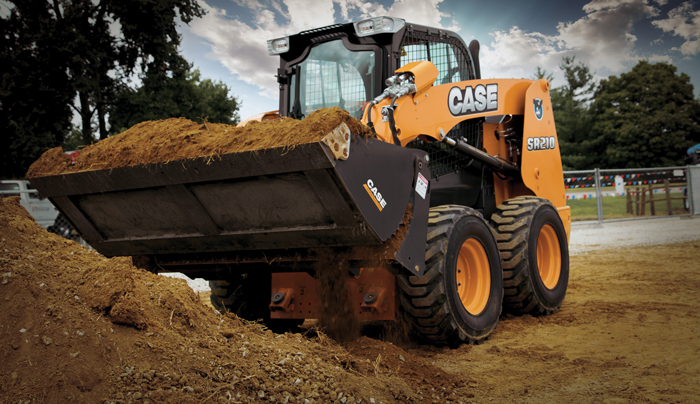 Case offers a total of nine skid steer loaders, ranging in operating capacity from 1,300 up to 3,000 lbs. This includes six radial-lift skid steers ranging in operating capacity from 1,300 to 2,500 lbs and three vertical-lift skid steers ranging in operating capacity from 1,850 lbs up to 3,000 lbs. Each Alpha Series skid steer from Case is engineered with a focus on providing the most power (torque, horsepower and hydraulic flow), while also providing a spacious and comfortable work environment and extremely convenient serviceability. This focus can be reflected in the recent introduction of the SR210 — one of the most popular size classes of all skid steers manufactured, says Case. The SR210 weighs in at 6,970 lbs and offers standard (24.2 gpm) and optional high-flow auxiliary (33.2 gpm) hydraulics for power and attachment versatility. Rated at 74 gross hp, the new machine offers a bucket breakout force of 7,270 lbs and 232 ft-lbs of torque. The skid steer offers an EZ EH (electro-hydraulic) setup menu that features nine preset speed and control settings that can be adjusted on the fly. This allows the operator to match controls to their preference for comfort and greater productivity. A single rocker switch allows operators to switch between the Case “H” operating pattern and ISO pattern controls. The skid steer also features push-button Ride Control, hydraulic one-way self-leveling, two-speed ground drive and an advanced instrument cluster with programmable security and automatic shutdown as options. It also features control handles with industry-exclusive “feel points” for better controllability and feathering. One of the most important features of the SR210 is its approach to Tier 4 Final standards: a CEGR engine with a particulate matter catalyst, which is made up of a diesel oxidation catalyst (DOC) and a high-efficiency, flow-through filter. This solution does not require filter replacement or the addition of fluids. The DOC converts emissions into neutral gasses. The remaining particulate matter then passes through to the high-efficiency, flow-through filter where it is stored and burned off, improving engine power by 10 percent. The skid steer loader features an electronic control module that logs operating data and has CAN-bus capabilities for diagnostic monitoring and telematics. This makes it compatible with Case’s SiteWatch telematics solution, which helps equipment owners track operating performance, maintenance intervals and demands, as well as equipment security. Like other Alpha Series skid steers from Case, the SR210 offers a wide cab at nearly 3 ft, and it’s fully sealed and pressurized against noise, dust and fumes. The cab-forward design provides best-in-class visibility, says Case, and ultra-narrow wire side screens, side lighting and a skylight further improve visibility. The machine also features the Case PowerStance wheelbase, which improves stability during lifting and hauling to help retain more material in the bucket. That stability also improves operator confidence when working on varied terrain.